Denis Sungho Janssens, a Belgian guitarist of Korean origin who has recently been expanding his music career in Seoul, is returning to Europe full of hope and ready for a challenge. The 38-year-old artist has been invited to perform at the Martha Argerich Project next month, part of the Lugano Music Festival in Switzerland, with other internationally acclaimed artists including cellist Mischa Maisky, pianist Sergio Tiempo and violinist Dora Schwarzberg. Denis Sungho is the first guitarist ever to participate in the annual event. The project, founded and hosted by Argerich, who is considered one of the best living pianists of our time, takes place in Lugano, Switzerland, from June 6-28. Renowned artists and talented young players will take to the stage in duets or chamber groups to play rarely performed compositions alongside masterpieces of the great composers, organizers said. “I am excited but I also feel challenged because it is a chance to introduce the guitar as a classical instrument,” Denis Sungho told The Korea Herald by telephone. 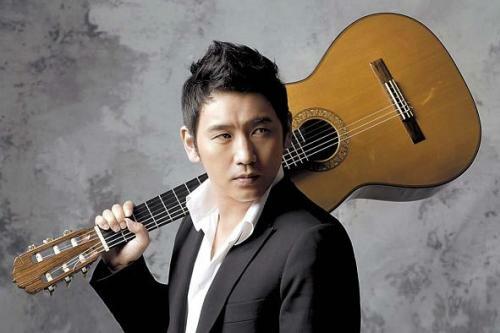 “He probably feels pressured because he is the first one and the only one to introduce the music of classical guitar at the festival in front of world-class musicians,” his agent Yoo Jung-min said. Denis Sungho will play a solo piece, Mauro Giuliani’s Rossiniana No. 15, on June 11 after a performance by Argerich and Nicholas Angelich. The composition by Giuliani, one of the leading guitar virtuosi of the 19th century, is a classic guitar piece the composer wrote from the operas of Gioachino Rossini. The 20-minute-long solo piece evokes Italy, nostalgia and romance. However, it is very challenging for the guitarist, employing highly technical skills. “It is like a drama, but never aggressive,” Denis Sungho said. The Martha Argerich Project also means a lot to him personally because it is hosted by the Argentina-born pianist who has been supporting him for nearly two decades. 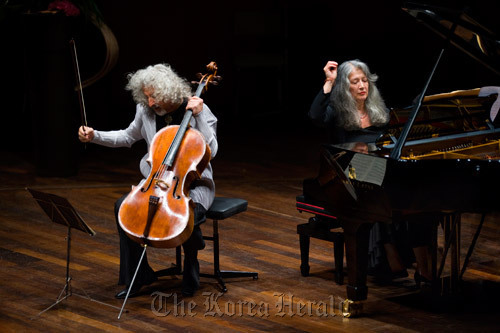 Argerich, known as the “goddess of piano music” financially supported the then-struggling guitarist 14 years ago by purchasing the Thomas Humphrey guitar he currently plays. She has high praise for Denis Sungho, who she says creates a very special sound. “She bought me a guitar when I was 24 and when I didn’t have the money to buy the instrument. She is a fascinating musician, free and an inspiring legend,” he said. Denis Sungho, a Korean-Belgian raised by Belgian parents, is the only guitarist in the world to have performed at both the European Concert Hall Organization and Carnegie Hall in New York. At the age of 14, he won the first prize at the Belgian Music Contest for Young Artists. Denis Sungho studied with Odair Assad, a renowned classical guitarist from Brazil who is better known as one of the “Assad Brothers,” along with his brother Sergio Assad. He is currently on a nationwide tour with Korean singer Insooni.